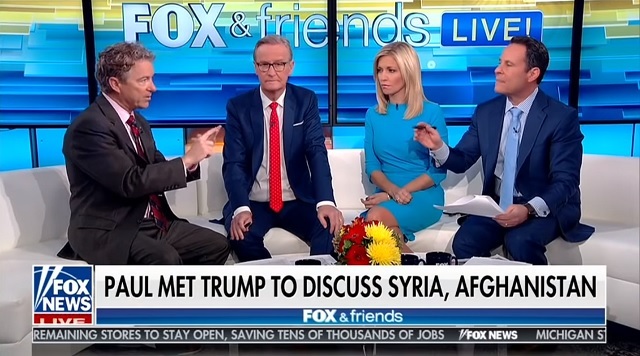 Senator Rand Paul appeared Thursday morning on Fox and Friends to discuss his meeting with President Trump on pulling out of Syria and Afghanistan. Brian Kilmeade, who criticized Paul yesterday on Twitter for supporting pulling out of Syria, similarly sparred with him today, saying the reason to stay in Syria is to "stop the next 9/11 attack." "When we had the 9/10 policy of Bill Clinton of not letting al Qaeda metastasize in Afghanistan, they end up taking, killing thousands of people here in New York City," Kilmeade said. "When we had the Barack Obama policy of pulling out of Iraq prematurely we get ISIS it almost lose the entire region." Rand responded: "We've been in Afghanistan for 17 years. So people like yourself saying, oh it's precipitous we're going to leave Afghanistan... We've been there 17 years! You will say the same thing in 17 more years, say oh it's too soon to leave in a thousand years you could say that. These people are going to be killing each other in a thousand years." Not mentioned was the fact that according to the official story of 9/11 15 of the 19 hijackers were citizens of Saudi Arabia -- which we're arming to the teeth. Rand Paul has fought tooth and nail against arming the Saudis and has seen great success. It's still not clear whether Trump is actually going to withdraw from Syria and Afghanistan or whether Paul is trying to pressure him to do what he said he would do and make good on his promise to end these neocon forever wars. Regardless, it's a good strategy and I applaud Paul for it.